A gang of thieves plan to steal $600 million that's about to be shredded from a U.S. treasury facility located in Alabama on the Gulf Coast. Because the inhabitants in the area of the facility have been evacuated due to the approaching Hurricane Tammy, they believe the heist will go off like clockwork. 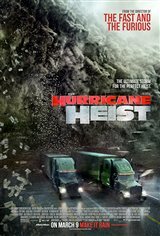 However, when the storm blows up into a lethal CATEGORY 5 and their well-made plans go awry, they need a vault code known only by Casey (Maggie Grace), a Treasury Agent. Grace is at the facility when the generator fails, so she calls in a local named Breeze (Ryan Kwanten) to fix it. When the thieves arrive, Grace escapes but Breeze is taken hostage. Grace finds an unlikely ally in Will (Toby Kebbell), a meteorologist terrified of hurricanes, who just happens to be Breeze's brother. She has to count on Will to use his knowledge of the storm as a weapon in an effort to defeat the bad guys.